All books in the bookstore are also available directly from Lulu. There has never been a more exciting time to collect Gruen watches. Compared to 20 years ago, the brand is light years ahead. 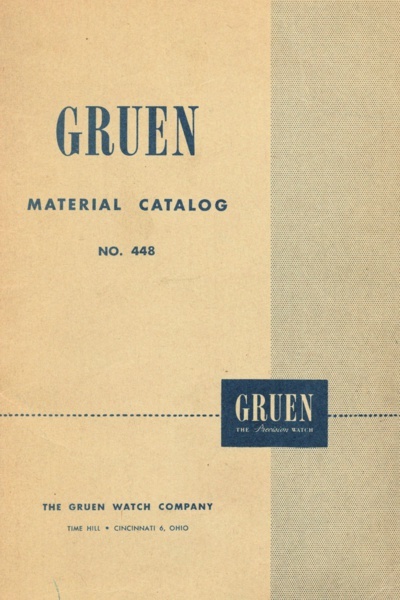 Where a single book dedicated to Gruen existed in the 1990s, there are now more than 10 in print and even more free electronic publications. NEW for 2015! 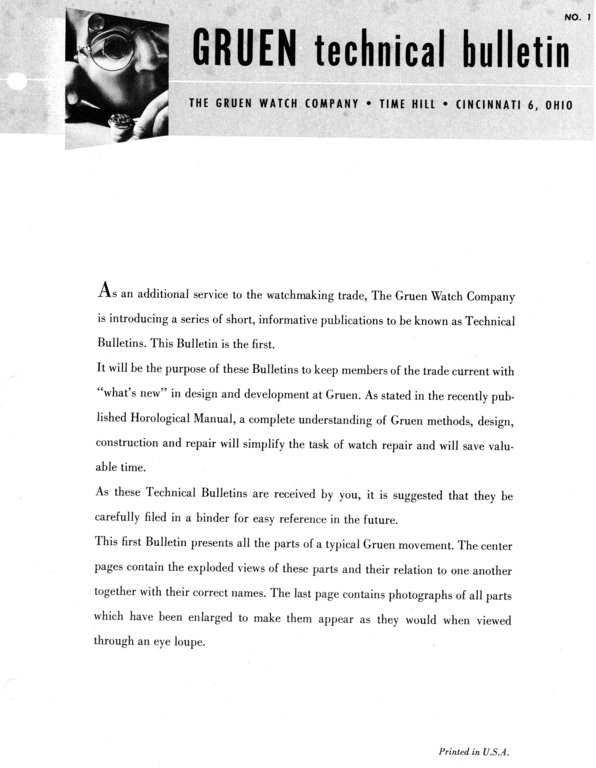 A complete duplication / clone of the relic that surfaced in the 1990s containing photographs of nearly every Gruen watch model from the 1920s to the 1950s. 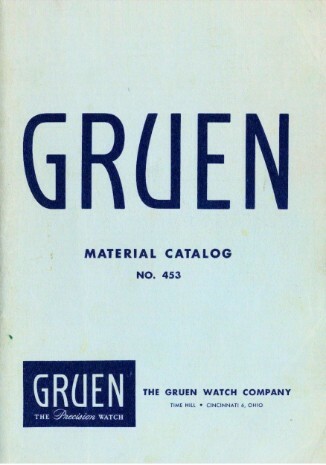 Read much more about it on The Gruen Watch Catalog page. NEW for 2015! Not known about until this year, this book is similar to the 1929 Guild book in format and era. 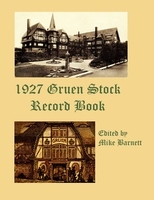 Read much more about it on The 1927 Stock Record Book page. NEW for 2015! The fourth and final book in the Decade Series of Gruen identification books. Like the other 3, this book uses advertisements from newspapers to identify watch models. 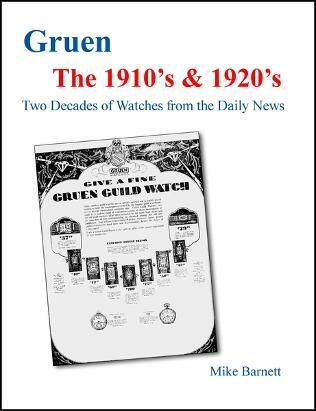 For Gruen watches prior to 1932 this book is the "Gruen Watch Identification Guide by the Gruen Watch Co.", containing color illustrations of 100's of Gruens with the model names of the watches using the name used by their advertising and by the public. No other book like it was ever published by Gruen. 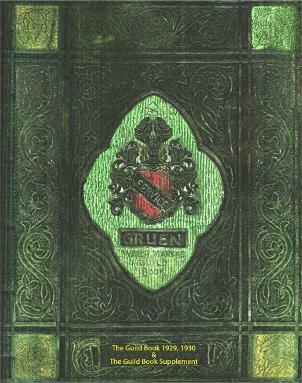 Leather bound, it was used to show Gruen's offerings to jewelry stores and to the general public. I know of only 4 or 5 copies of this book so it's time for it to be made widely available so that those wishing to have a copy can own one. This book is one of the few early Gruen published books that has extensive model identification information. It has not only the early Gruen watch models, but also contains much data on the movements, the history of Gruen and their factories, and a rare look at the Gruen pocket watches. The historical text is deep and rich. Regardless, this is hands-down the most GORGEOUS book that Gruen has ever published. Each book was numbered so that each jeweler was tracked as having a copy. It is extremely rare that these books come up for sale and this copy is a particularly good, clean one. You can now purchase Volumes 1 and 2 in a single hard cover book by visiting the Lulu bookstore. The price is $100, the same price as the combined price of the individual soft cover volumes. Click the Lulu Buy Now button to the right to be taken to the Lulu bookstore to pick up your copy today! I stock very few copies of this book. If you see it available in the shopping cart area above, then I have it in stock. If not, you will always find it in stock at Lulu. International customers, please check out Lulu first as they print in International locations and ship to you locally. Don't have Volume 1 or Volume 2? Get the hard cover Collector's Edition containing both volumes for the same price as the combined softcover prices. 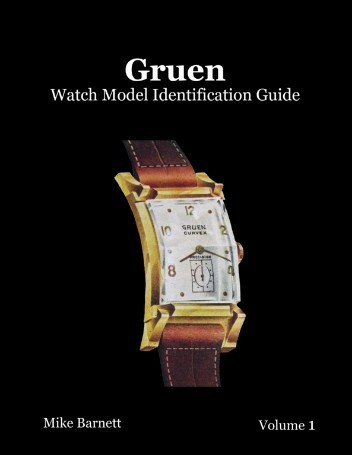 The Gruen Watch Model Identification Guide Volume 2 is finally here! Immediately after the release of Volume 1 in 2010, work on Volume 2 began. It's taken over 3 years of intensive research and compilation to get it released. Volume 2 picks up where volume 1 stopped. Friends and customers both had the cry for "more of the early watches!" Early watches it is. In the first book I made it more oriented toward the 1940s. 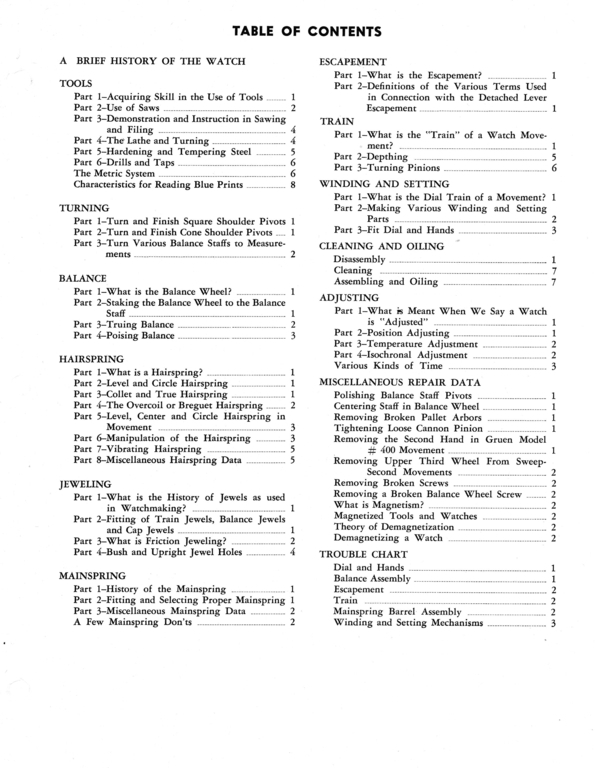 There are 12 pages spanning the years 1912 to 1933 in Vol 1. This book has 43 pages representing the same time span. Volume 2 also extends out further into the 1950's so those early 1950 models we all run across can be more easily identified. Gruen Watch Model Identification Guide Volume 2 contains considerably more watches than Volume 1 -- 60% more to be exact - so that the two Volumes together provide identification for over 1,000 Gruen watches. Specifically, Volume 1 has 97 pages identifying 389 models while Volume 2 has 170 pages that identifies 648 watch models, totaling more than 1,000 watches. Amazingly this accounts for less than 1/2 of the watch models Gruen made. This is not a "Price Guide". The only prices are the ones the watches originally sold for. But the illustrations are better than anything you've seen in price guides. 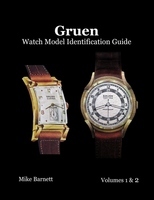 The book's title describes exactly what the books are for -- Gruen Watch Model Identification Guide. 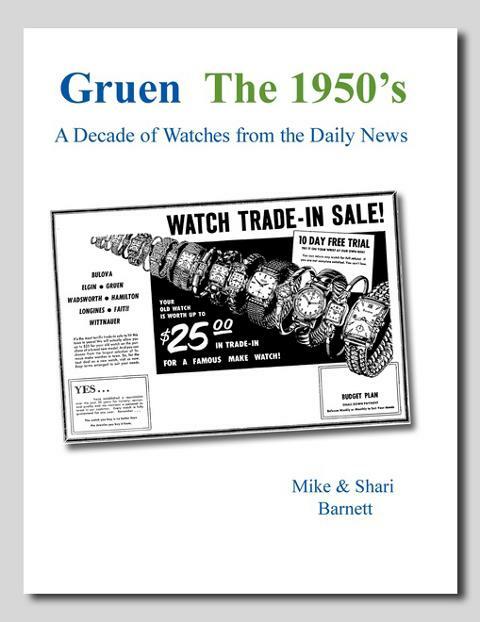 Use these books to identify your Gruen watch, when it was made, other variations, plus quite a bit of technical data. These books have been described as "Coffee Table" books because they're so detailed and are in color. Enjoy all of the hard work the men and women of the Gruen Company put into their timepieces. This book's index includes more data about each watch. In addition to the name and the year, you'll see information on the movement, number of diamonds, other stones used, the case material, and the original price. Not only will you get this index for volume two's watches, the index is a blended one with volume 1 and volume 2 watches co-mingling. The volume 2 watches are in red, volume 1 black. As you can see, there are some good reasons behind the delay and some very real benefits readers will receive as a result of the lengthy process of creating this colorful guide. I believe it's worth the wait and hope you will too. If you do not yet own Volume 1, pick it up too! The first identification book of its kind. The Model Name Identification Guide will help you identify your Gruen Curvex, Veri-Thin, Quadron (12 of them), Cartouche, Autowind, and other watch model families. Expanded information such as names for watches when a flex-band was included. This series consists of FOUR individual books. These books are a second and different series of identification books than my “coffee table” style Model Identification Guides below. Each book series serves their own distinct purpose. These Decade books are looser in format and content. They are about telling the story of Gruen watches over time. Each of the four books are black and white and feature their watches in the exact chronological order they were found in this nation’s (and sometimes Canada’s) newspapers. You get a sense of how Gruens evolved and morphed from one watch or watch family to the next. Sometimes model names are present with watch illustrations, sometimes not; it all depended upon the advertisement. You’ll find these watches repeated a number of times, on purpose. Sometimes the angle was different, others the years differed, or even a price difference was enough to keep a repeated watch in the book. They are an entertaining read as the language used to describe Gruens also changed over time. Words like “neat”, “smart”, and “sturdy”, were the popular adjectives of the day in the 1930’s for example. All four books total to over 5,500 watch images! Even better news, out of those over 1/2 of them contain model names. Each book has an extensive index that includes information about model name, number of jewels, case materials, type of movement, the price, and the number of diamonds. I'm sure you'll find these to be one of the most interesting and entertaining watch identification guides available, regardless of brand. * Note that the sample images shown are from all three guides, not just The 1930s. Using the same format as "The 1930's" book above,"The 1940's - A Decade of Watches from the Daily News" continues the Decade Series with 1,625 watches from the 1940's shown and then Indexed THREE ways. It's another large book, 340 pages. And finally, also using the same format as "The 1930's" book above,"The 1945's - A Decade of Watches from the Daily News" continues the Decade Series with 1,675 watches from the 1950's shown and then Indexed THREE ways. It's another large book, 347 pages. 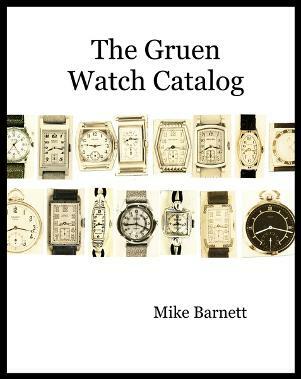 Another book with over 1,500 GRUEN WATCHES. 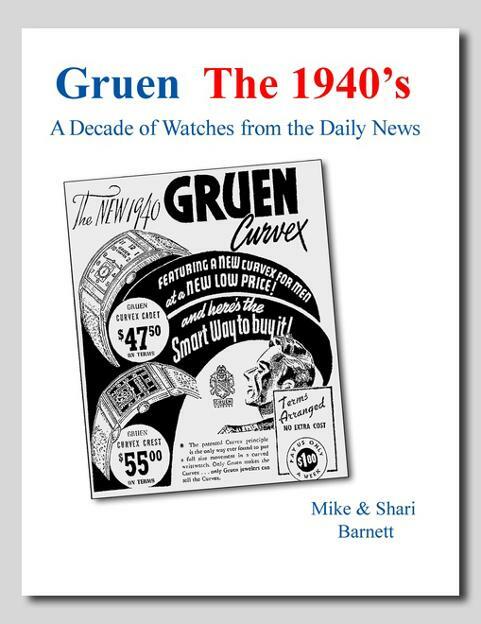 Read that again, another book with over 1,500 Gruen watches. If you can't find your watch in all these guides, well, you're not looking hard enough. This reference book often gets more use than any of the other Gruen books available in the bookstore. As a result, this durable hard cover edition is now available through the Lulu bookstore. Lulu has been an excellent supplier of all of these Gruen books for both Domestic and International customers. This item is often shipped directly from Lulu to you due to the high shipping costs. If I have it in stock, I'll ship it to you. If not, your copy will come direct from Lulu. It's the same high-quality book regardless of which method. A 500-page, phone book sized, definitive guide for Gruen movements, parts, and interchangeability. 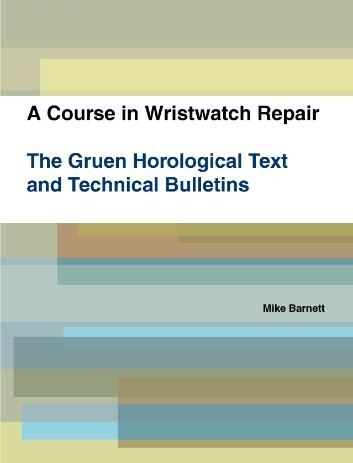 It's an exhaustive compilation of all technical / repair related Gruen publications. 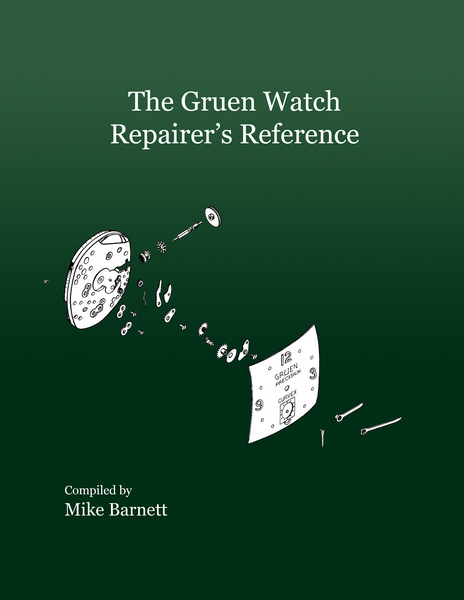 If you repair Gruen watches, or want to know more about your Gruen's internal workings, or simply want to quickly fill your horological library with all of the Gruen material guides instead of buying each one, then this is the ideal book for you. You receive a lot of information for your money in this phone-book sized book! There are 500 pages of Gruen-goodness inside. Even if you own some of the repair guides, it's unlikely you have them all, including the supplements. 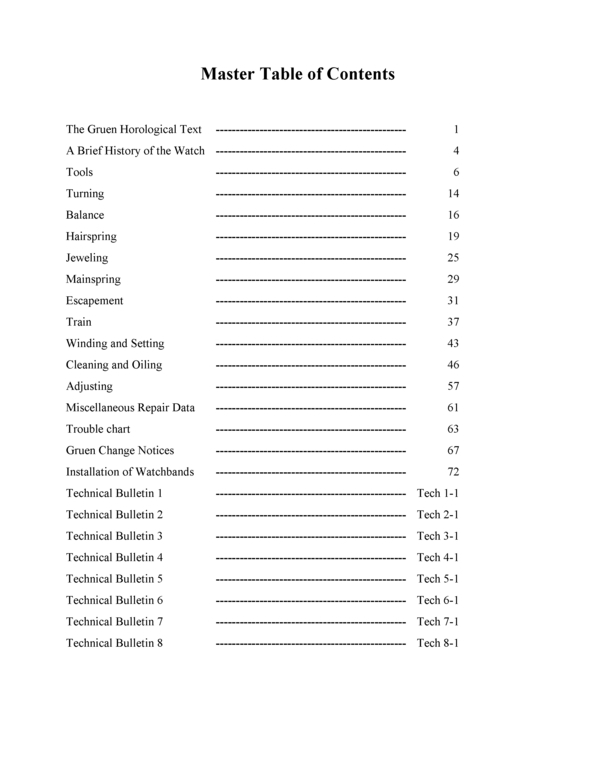 In addition to the Gruen publications, there is an extensive quick reference guide of Gruen movements that includes their date of first production, hand sizes, movement size and basic interchangeability. Notes on each movement include number of jewels, additional features such as autowind, sweep second. Adjunct material included from GS and Swartchild. 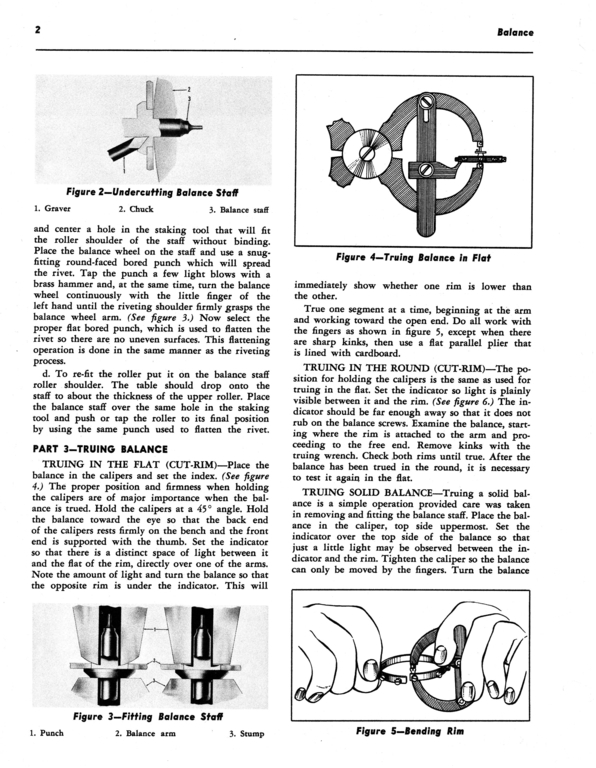 And, often used tables were pulled from multiple catalogs and assembled in one easy to find lcation for items such as the balance complete interchangeability, Gruen published hand sizes, mainspring sizes, crown sizes. 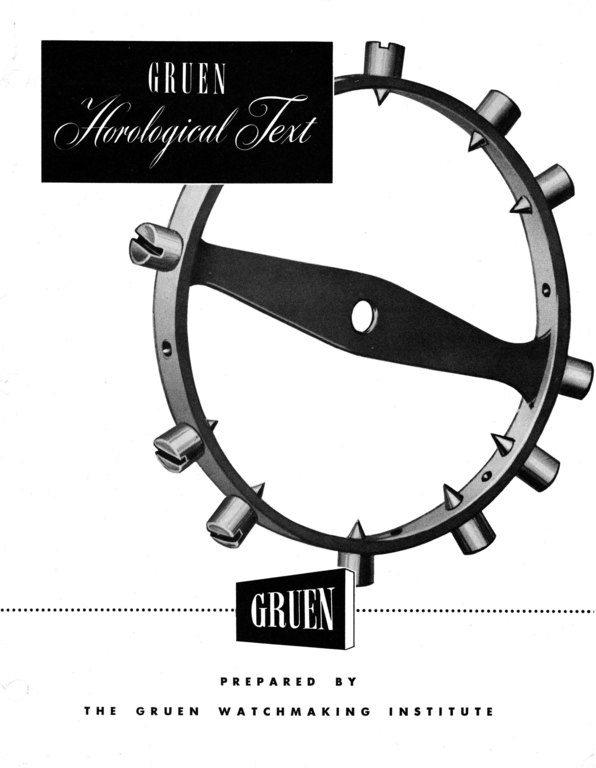 The Gruen School of Watchmaking created the Gruen Horological Text in 1948 as a means of teaching students how to clean & repair wristwatches. It is not Gruen watch specific, and covers basic topics as well as more advanced ones such as balance poising and hairspring manipulation. Readers new to watch repair will enjoy the hands-on, step by step style of the textbook. Also included are the difficult to find all 8 Technical Bulletins released by Gruen. 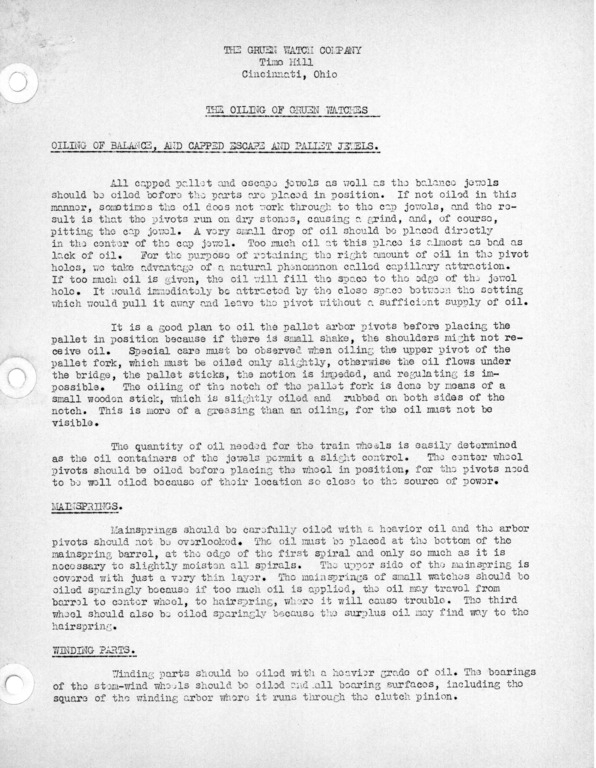 There are even memos from Gruen announcing new technologies and changes in procedures for repairing watches. If you don't yet own this catalog made by Gruen, this is an opportunity to pick one up inexpensively. Additionally, your copy will be a new printing with the pages cleaned up and perfectly white. They look better than when Gruen published them. All material are copyright © 2014 by Second Hand Press. Permission for re-use or distribution, in any format, is not implied nor granted.